A burglar who left a Northampton family traumatised after he broke into their house while they were sleeping has been jailed for two years. 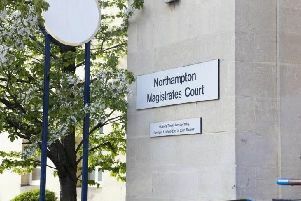 Simon Norman, aged 26, was with Karl Boyle, aged 18, in Cedar Road, Abington, Northampton, on the evening of December 10 when the pair tried to break into a series of cars. Northampton Crown Court heard they managed to open a Renault Clio that had not been locked properly and then uncovered a house key. Norman then used the house key to enter a property on the road and stole an XBox, Peugeot car keys and cash while Boyle waited outside. Dominic Woolard, prosecuting, said the mother of the family woke up to find the door was open and assumed it had been left that way by her eldest daughter. Mr Woolard said the woman, who was in the house with her husband and two other children, then went to the toilet and heard the door open and slam. After checking the house, she found that her daughter was not inside. The court heard Boyle, despite not having a driving licence, then drove the stolen Peugeot away from the property. An off-duty policeman followed the car and witnessed it travelling at 60mph in a 30mph zone. Boyle and Norman were eventually stopped by police and officers uncovered a clawhammer, a three-inch knife and scissors in the car. A victim impact statement read by Mr Woolard stated the burglary had left one of the children unable to be alone in the house. He said: “The family members are constantly nervous and fearful at home and feel conscious of anyone watching them when they lock the front door. “One child has been particularly badly affected mentally by the whole experience. She could not sleep alone for three weeks as she keeps replaying scenarios in her head when she hears any noise in the night. She can’t stay in the house alone. Norman, of no fixed abode, who pleaded guilty to burglary, theft, aggravated vehicle taking and possession of a knife, was jailed for two years by Recorder Geoffrey Solomons. Mr Solomons said: “This burglary has caused considerable upset and distress to the victims. Boyle, who pleaded guilty to theft, burglary, aggravated vehicle taking and dangerous driving, was given an 18-month prison sentence, suspended for two years. Recorder Solomons said he had come “very close” to a custodial sentence but there were “powerful mitigating factors” including his age and lack of previous convictions. Boyle, of Wedgewood Road, Birmingham, was also disqualified from driving for 18 months.